1.6 How to Apply Online for TS Anganwadi Recruitment 2017? Latest 5479 Anganwadi Jobs in Telangana 2017 Notification will be released soon by the Women Development and Child Welfare, Telangana. Interested candidates can refer the eligibility criteria for the Telangana Anganwadi Recruitment 2017 @ wdcw.tg.nic.in. 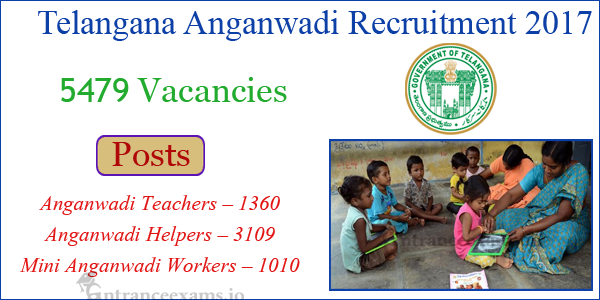 Eligible individuals can apply to the Anganwadi Teacher, Worker, Helper Vacancies in Anganwadi Telangana. Get more details of WDCW Anganwadi Recruitment 2017 Telangana such as selection process, pay scale, etc from this page. Latest Update: The Telangana Anganwadi Recruitment 2017 Notification issued for Peddapalli, Sangareddy, Medak Districts. Eligible candidates can apply to the wdcw.tg.nic.in Recruitment 2017 on or before 21st October 2017. Get further details of the Anganwadi Telangana Notification 2017 from the below sections. TS Anganawadi Notification 2017: The Women Development and Child Welfare, Telangana released the notification for the recruitment of eligible aspirants to fill Anganwadi Teacher, Worker, Helper posts on regular basis. The reason behind the release of this wdcw.tg.nic.in Notification is to fill 5479 Anganwadi Jobs in TS. This is the wonderful opportunity for the Job Seekers. So, why late, hurry up to check your eligibility for these vacancies. We are here to provide the overall information of the Women Development & Child Welfare Jobs. After the official release of Anganwadi Telangana Notification 2017, you can apply to the WDCW Mahila/Women Anganwadi Worker Jobs through online. Aspirants who passed 10th Standard from the recognized board are preferable for TS Anganwadi Mahila Worker/Helper Vacancy 2017. Continue reading to know more details of the Anganwadi Recruitment 2017 Telangana. Individuals who are interested to apply for the Anganwadi Jobs in Telangana should ensure their eligibility criteria. Aspirants who possess 10th Standard from any recognized board with good percentage are eligible to apply for TS Anganwadi 2017 Recruitment. Refer the official advertisement for the Post Wise Educational Qualification required for the TS Anganwadi Recruitment 2017. The Upper age relaxation for the reserved individuals is as per the rules of Department of Women Development & Child Welfare. Aspirants who are going to apply for the Anganwadi Jobs in Telangana should know some details such as application fee, pay scale, etc. So, look at the below sections for those details of TS Anganwadi Recruitment. Candidates are intimated to refer the Anganwadi Telangana Notification 2017 for the pay scale details. The Women Development & Child Welfare (WDCW) will consider the online application only after the payment of a fee. Refer the Official TS 5479 wdcw.tg.nic.in Notification 2017 for the application fee details. How to Apply Online for TS Anganwadi Recruitment 2017? First of all, Candidates have to visit the wdcw.tg.nic.in, the official website or click on the direct link attached here. Search for the TS Anganwadi Notification 2017 on the homepage. Refer the official notification for the eligibility criteria. If you met eligibility, click on the Telangana Anganwadi Recruitment 2017 Apply Online link. Fill the online application form with your details such as Educational, Personal information. Upload the scanned photograph and signature as per the mentioned dimensions. Finally, take the printout of the Anganwadi Recruitment 2017 application form for future reference. We have provided the complete information regarding the TS Anganwadi Notification 2017 on this page. If you need any other information of the Anganwadi Recruitment 2017 Telangana, leave your comment in the below provided box. And, keep in touch with our www.entranceexams.io website for the Upcoming Government Job Notifications. TS Anganwadi Worker Apply Online link will be active from 12th October to 21st October 2017.
please send me anganwadi apply date and latest notification.